I wish to present here the benefits of utilization and operation of MV/LV parallel transformers in electrical distribution. Having such experience, i will be interested to get feedbacks from other engineers. For all my experience, I’ve never met a working electrical installation, where operation of parallel transformers was used. Once, we used this solution in the design of welding shop, mainly to reduce the voltage drop in the network and maintain a stable level of short-circuit current. But the project was stopped by the Employer, and the idea was gone. Below is the list of benefits of such solution, as it is seen. It would be great if interested engineers commented and shared experiences on this issue. 4) Increasing the reliability of operation of protective devices in the case of phase-to-earth short circuits in the network. Parallel transformers are allowed, provided that none of the windings will be loaded by current exceeding allowable current for that winding. or copy this trackback: http://engineering.electrical-equipment.org/electrical-distribution/parallel-transformer-benefit.html/trackback from your own site. This post is very useful. Parallel Distribution network information with diagrammatic representation is very helpful and nice. thanks for providing such information. it helps us to clear our queries. This post is very useful. Parallel transformer is quite interesting. It will help to decrease transformer faults rate. For parallel operation of the Transformers, they should have same short circuit current level. And what do you do with your short circuit current increase in your installations !!! Yes it’s a good Idea for the System reliability. I have seen it in refinaries and GasPlants (K.N.P.C-Kuwait) But only the problem is the short cirtcuit level will be higher and you have to go for a high sizing of Bus Bars and Switchgears ( economically burden is there). I have come across huge problems in the past with this arrangement. Whilst parallel transformers increase redundancy the prospective fault level doubles. Also if there is a fault on one incomer where the TFers are utilized more than 50% each the overall system will be lost due to overload. Capital cost / expenditure for clients is also increased. Using two (or more) transformers in parallel might cause problems. The voltage level of the transformers need to be exactly the same, from no load to full load. If not, then there will be blind current running from one transformer to the other. Running with generators is about the same but then you can change the voltage charcteristics (voltage droop). With transformers you do not have any possibilities to change the voltage charcteristics. In my field of application I do not apply such configuration. However some time I found it already implemented in some installation without the proper protection arrangment. It is extremely important to implement the directional overcurrent protections otherwise the configuration is useless and dangerous. Other important points are the short circuit level that shall be consdered. Speaking on my behalf this type of distribution is quite common. Not just in refineries but also steel mills, glass production, pharmaceutical, ciment factories and even in some cases supplying tertiary installations. The comments made earlier regarding this type of distribution reflect the aspects with which this type of distribution has been evaluated. Cost, efficiency, redundancy, reliability, network quality, loss of production etc. There are cases where this type of distribution is obligatory by law (Hospitals). The “rules” mentioned for the use of parallel transformers by the author are also used in Belgium although they are not officially included in the electrical regulations, they are considered however to be good practise. So proper -technically correct- design is mostly dependant on the way the design engineers conceive the whole distribution. Just as in any case if something is not done properly then it should not be expected to perform well. So yes, when dimensioning such a network all the afore mentioned factors (short-circuits levels, busbars cross-sections) should be taken into account to correct implement this type of distribution. The main parameter regarding circulating current is the transformers voltage ratio. They shall be equal as far as possible. For transformer with off load tap changer it’s important to check that the two transformers taps are in the same position. Parallel operation of two or more than two transformers have the following conditions to operate and function effeciently. 1)Primary and secondary Voltages are the same. 2)Percentage impedance is the same otherwise circulating current causing losses and heating up of the Transformers. Rating in MVA/KVA is equal for loading sharing equally. 3) TAPE POSITION particularly in”ON-Load Tape Changer Transformers” is the same otherwise one of them will be carrying high current and circulation of current cannot be avoided. I would recommend a bus section normally open switch connected as a 2 out of 3 autoselective scheme. Generally this is the approach in oil and gas electrical design. Switchgear is designed to include the high short circuit not for the two transformers operating in parrallel but for the contibution to the fault from the motors. In oil and gas installations there are generally duty and standby motors and with all A motors connected to the A bus and B connected to the B bus, the loss of any one of the 2 transformers would not effect items connected to the busbars; ie 1 transformer is sized for the total load. Note in normal operation there are 2 transformers carrying each 50% of the load. This is considered to be a very reliable solution and does not incur the increase of fault levels and circulating currents when parallelling transformers. To reduce the size of transformers forced cooling could be employed as one transformer carrying 100% of the load would not be a normal running condition; although the cost of forced cooling fans may be a similar cost of the difference in the kVA rating! As commented by other posts paralleling of transformers results in higher fault levels, circulating currents and if sized as 2×50% machines, possible overload of one transformer should one transformer be out of commission. Utility networks companies do not generally parallel transformers in the distribution of electrical energy; providing resillience of supply by alternative switching. I personally would not parallel transformers I think any benefits are outweighed by the disadvantages. Other apparent advantages mentioned in the text can be achieved in other ways. In case of parralleling transfomers , the switchborad prospective fault rating will have to at least equal to the fault 2 * transfomer fault current. 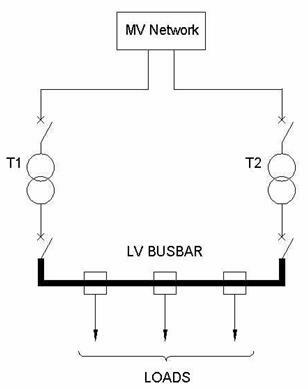 Even when the load is shed, when a fault occur at the main bus it will replicate fault situation on both transfomers. the fault current will realy on the short circuit volatge of each transformer minus the volatge drop at any impedance between the tranformers and the fault position. Hence it will be mandatory to sizs the switcborad ( combining both tranfomers secondaries) to 2 the fault capacity of s ingle transfomer. Which means the fault level would be twice as high, which would mean extra costs in buying switch gear to withstand a higher short circuit fault. All trip settings would also be less sensitive when it comes to grading of the complete network. The standard practice to do “paralleling transformers” is only worth while if you have a single load that runs on the limit of one transformer. Very useful information – thanks – for my teaching – Electrical Power. Some books even don’t go into too much detail on paralleling T/Xs, only the usual sam clock number, same rating, etc. Thanks! Correct me if Im wrong, but will the use of 2 transfomers in parallel result in higher recative losses as opposed to using a single transformer with combined KVA capacity. This may be significant when the transfomers are not fully loaded. in power transformers. I have no working experience with power transformers. Parallel operation of transformers results in increase of fault level on the downstreamside of transformers and resultant increase in cost of downstream side ciircuit breakers, panels etc may nullify the benefits of parallel operation. Perhaps this might be the reason why it is not practised widely. is far less in toroidal transformers. Do you realise that you household consumers of electricity are paying for the coreloss which you have no control over? As far as I’m concerned, I have experience of parallel transformer in two types of installation. –	use of parallel transformers. In that case parallel transformers allow the use of standard transformer, and this point is interesting in terms of failure, it’s easier to replace a standard transformer. –	up to 4 transformer can be coupled to reach the required power and short circuit power. The typical applications of these solutions are automotive industry or similar industry using welding process. –	redundant solution to limit the impact on the application in case of a transformer failure. The type of application in that case can be hospitals, big tertiary buildings, hypermarket in certain countries. between UK and Europe, I guess that there must be a lot of breakdown of power transformers. I heard that Insurers would have to pay quite a sum for the downtime in electrical supply. good topic.finding solutions to the disadvantages will be interesting. needs deep pocket. Insurance in this business must be very expensive. ok….its good but more expenditure is required……….! i am only a student at the moment but i thought paralleling tranformers was only used for redundancy. as in that a large factory that cant afford a large amount of down time would have a medium voltage ring and if one transformer went down the other would be switched in. …if one tr went down, the other would be switched in.” —– This is not transformers in parallel operation. This is a case of a standby being brought on line following a failure. It would be far better and cheaper to use ring feeds to cut the amount of down time. “Paralleling transformers” would mean more down time if a fault do happen on a “paralleling transformers” arrangement so it is not a advantage but a disadvantage if you look carefully at it. going down on one production line because one paralleled transformer failed. one would have to fight against mindsets in professions. I work for Caterpillar Co; we usually connect our all generators in parallel those they output LV and then the Genset LV out put as each generator has its own MV transformer rating 13.8KV, then all transformers are connected to one buss-bar (we call it grid) through fs switch gear, mean each circuit has its own protection that is connected to grid. Furthermore, the advantage of raising the voltage is great as that decrease the diameter of supply conductor plus reduction of LV switch gears, as an example, we supply 10M Watts power at the distance of 200 meters through 4 500 mm2 cable that is almost 75% less copper conductor is used. Nevertheless, all that configuration required perfect design by professionals. As an engineer, that is one part of my activity as well. CAT trained their engineer and they have proper tool to train. I shall welcome any question if some body wants to explore it. sou engenheiro eletrico em Brasilia Brasil e dono de uma firma do ramo. eu trabalho com baixa tensão e DATA CENTER e instalo muitos UPS em paralelo redundante com transformadores ligados em paralelo na saída dos UPS. se os transformadores não forem iguais como potencia, tensão, impedancia, variação de tensão e defasagem angular, esqueça. é problema na certa e cabeça a premio. se o casamento dos transformadores é perfeito a segurança do sistema é perfeita e a manutenção muito tranquila. would you know if it is ok for circuits from one transformer share a neutral from another if both neutrals are connected, will it hurt the transformers, to bond the neutrals? this is murugan , iam an elctrical enginner , i have been working as a project enginneer in transmission and distribution field , you gave some good needs, i want to know the parallel conection of transformer with single circuit line . i will be thankfull to you if you will give information about the above. I shall be shortly going for major surgery in a local hospital. Not being an expert, my remarks are basically armaturish. Operating identical (or nearly identical or equivalent) transformers does not pose problems. That is the transformers should have the same (1)voltage ratio, (2)same percentage impedance, so that load sharing is even at different loads, (3) protection to avoid flow of current from one to the other either as a fault current or a circulating current due to mismatch of internal voltage (terminal voltage will have to be the same as they are connected). Protection scheme will have to have reverse power relay. Generally designers prefer to avoid parallel operation as operating personnel and maintenance personnel can create problems itf not adequately equiped. If parallel operation is provided to realize some of the advantages, then specific operating & maintenance instructions should also be dispalyed. In addition to the three points mentioned, there are two more obvious points – (1) same phase sequence and (2) same vector group. This depends merely on your requirement. At first, it is not ecenomical to employ two-500kva transformers as compared to a single 1000kva unit. In the economic point of view, it is not advisable as you will be doubling the cost for: switchgears, controls, maintenance.However, if money is not a problem, two 500kva transformer will be giving you more advantages like: flexibility in terms of more maintenance door, load shifting and would avoid total equipment breakdown as it is very rare to experience both transformers failed at the same time. There are no big differencies from electrical standpoint for supplied loads. Total Inrush current from MV side will be higher for 2 x500kVA, but with a lower time constant. No load losses could be higher too. – Possibility to partially supply the site in case of one transformer failure (after load shedding). In that case the operation of overcurrent protection with half the short-circuit current shall be checked. – Some customer operating many MV/LV transformers (such as airport, underground transportation, but also hotel chain, retail chain…) have some benefit to use only one rated power of tranformer to limit spare parts and standardize installation. They adjust the number of transformers according to power budget of each site. You have to remember that transformers don’t fail often but when they do the down time could be long because of delivery term, handling issues… So the possibility of power transformer replacement shall be checked for critical electrical distribution. What procedure would one follow when connecting two transformers(Two transformers which meets all the requierments) in parallel keeping all safety aspects in mind? The manufacturer will tell you the proper procedure to connect and install the transformers. Unless you are thinking of a special application that requires extensive planning and preparation. While this setup does have it’s advantages like the use of parallell transformers to improve redundancy, it does raise some concerns as well. How about increasing of the fault level? OR Overload issues? While precautions can be taken to minimize these risks, the greatest downfall at least in my opinion is the cost/value ratio. The increase in capital expendature to clients in my opinion does not justify the proposed benefits. Just my 2 cents. Simple,economical,practical,cost effective solution-at the stage of design paralleling is possible. For addition and alteration purpose -paralleling is too difficult and will not be cost effective. So try in designing stage not in operation. 1. higher first cost at it will need higher primary disconnect, redundant transformer, extra switchgear and controls. 2. when one of the transformer fails, there is a tendency to overload the surviving unit unless the connected load is limited to below 50% of the designed capacity. 3. when on of the transformer fails, it will take time to order and procure for a replacement as the replacement unit must be customized according to the characteristics and specifications of the existing unit. 4. it will also need a bigger space to accommodate two transformers. But the short circuit will be increase, and in case they have OLTC they should have master and follow. 1. Tranformer take 1100 volts and out put 410 voltss and other transformer also same. 2. If one of them transformer’s effecincy may be down or there will be any broblem or any varriation in any transformer, (Spose transformer in put 11000 volts and out put 410 volts and other transformer in put 11000 volts and out put 400 volts) and both transformer ‘s togher on one bus bar, what will be happen. I think this will creat problem. Please send me its solution. The requirements for paralleling are: transformers should have the same voltage, same frequency , same phase sequence and also they should have the same size. If there is voltage difference between the two transformers, arcing would take place and could damage the transformers depending on the extent of voltage difference. If two transformers are on the same high voltage busbar and on the same low voltage busbar, difference in transformers ratios will produce circulating currents (there will be no arcing). Transformer with lower value of ratio (which means higher voltage on low voltage side of transformer) will increase reactive current (to obtain higher voltage drop in transformer imedance) due to circulating current and transformer with higher value of ratio (which means lower voltage on low voltage side of transformer) will decrease reactive current (to obtain lower voltage drop in transformer impedance) due to circulating current – this is physical explanation of circulating currents and why both transformers have the same voltage at low voltage busbar. Any changing in position of transformer will cause arcing, and it is allowed only in transformers with On Load Tap Changers (OLTC), where arcing happens in special chamber. In case the secondary voltages are not same (but other requirements for parallel operation); during closing circuit breaks at low voltage may be will cause some sparks inside circuit breaker chamber but for continuance operations will cause circulation of current between two transforms which cause increase or transformer’s temperature. thank for the big benefit for me,, although i am not electrical engineer.. Connecting single phase transformers having the same specifications will enable the use of a physically smaller packaged, while increasing the total capacity or amperage rating thru the parallel connections of the low voltage secondary windings. Typical example of such approach are used in low to medium sized spot welding, or electroplating application machines. Where a very low voltage is required, say 50V, that is enough as well as the capacity to carry and provide current range to up several hundred amperes. The cost of manufacture is another advantage achieve through the use of a much smaller gauge or size of magnet wires in the transformer fabrications. Can we run two transformers of different rating(MVA/OR KVA) in parallel for equal load sharing.Voltage ratio,frequency and phase sequence are the same? You can run two desribed transformers of different nominal power rating S1 and S2 (MVA or kVA) in parallel with same voltage ratio, frequency and phase sequence. Loads of transformers with different nominal power ratings will be equal only if their short circuit voltages are in this relation Uk1/Uk2=S1/S2. Transformer with higher nominal power should have higher value of short circuit voltage. This means that impedances Z1 and Z2 are equal. Impedances can be calculated from Uk (short circuit voltage) as Zk=(Uk/100)*(Un**2/Sn) where Uk (%), Un (kV) and Sn (MVA). Transformers used in distribution ordinarily have approximate equal Uk (short circuit voltages) and according to that transformers with higher nominal power has lower value of impedance. It means that in parallel transfomer with higer nominal power will have higer load, and transformer with lower nominal power will have lower load. For example two transformers with equal short circuit voltages with load of 15 MVA – transformer of S1=20 MVA will be loaded with 10 MVA and transformer of S2=10 MVA will have load of 5 MVA. could you explain operation procedure for this system..? Is it possible to parallel of those transformer where one of those transformer already loading 80% with the other one with load =0 (Zero), or transformers must be parallel in condition load =0 for both of transformer..? are we need an interlock between MV breaker and LV breaker of those Transformer..? Yes, it is possible to put in parallel transformers in case that before paralleling one have 80 % of rated load and other one 0 %. Before paralleling transformers the best is if transformers are at the same positions, but there will be no problem to paralleling them if there is a litlle difference in positions among transformers (one, two and possible morethan that), but in this case you will have circulating currents. I did not know what did you mean with your second question about interlocking. benefit of using two transformers in parallel it really increases the efficiency of the system but obviously this system is expensive. we can connect a 80% loaded unit in parallel with a 0% loaded unit. but the conditions of polarities ,voltage ratings i.e. turns ratio,inductance to resistance ratios phase displacement between primary and secondary line voltages and phase sequence in case of three phase transformers should be met. and for your second question according to my knowledge a split second bus with a tie breaker interlocked to prevent parallel operation is necessary in this case. Will the adding of inductors on the secondary side of each transformer help. It’s obvious this cause higher cost but in spite this disadvantage, will it help? Disadvantage of circulating currents is increasing of losses. Load sharing is connected with different short circuit impedance (mainly reactance because R<<X) characteristics of transformers. In most cases transformer impedance has the biggest value of short circuit impedance at lowest position and the smallest at highest postiton. Characteristic of short circuit impedance is not straight line but curve which is mostly close to straight line. It should be noted that in some OLTC and winding construction there could be large steps between two position while other has smooth step. Parallel operation methods for parallel operation of transformers imply circulating currents minimization so circulating currents (which could not be fully removed due to different factors) are at low values and thus circulating currents increase losses at very low level. Of course increasing overal inductance (reactance) using inductors (transformer reactance+inductor reactance) will effect in circulating current reduction. Load sharing could be equalized if added inductors equalize overall impedance (reactance) among transformers. Inductors built in secondary side of transformers could help to decrease short circuit currents in places where it is necessary. My opinion is that there is no need to add inductors on secondary side of transformers regarding to parallel operation of similar transformers (circulating currents and load sharing) because of inductors costs, increasing maintenance cost, decreasing reliability (more devices), need for new parametrisation of protection devices and automatic voltage regulators, etc). Switch gear details and ratings depend of some factors. One of them are rules and techinical rules in countries and technical recommendations also. Rules are different in different countries. Is parallel operation of 10MVA and 5MVA possible? Yes, it is possible. Transformers must have same vector group, similar nominal turn ratio. It is desirable that short circuit voltages are not differ more than 10 %, because difference in short circuit voltages cause difference in percent loading of transformers (transformer with higher short circuit voltage will have lower percent load). If this two transformers have the same short circuit voltages transformer with 10 MVA will have (depends on ratings) impedance 2 Ohms and transformer with 5 MVA will have 4 Ohms, so load of transformer 1 will be 10 MVA while transformer 2 will have load of 5 MVA. Thankyou Sinisa Spermic… Really appreciate it ! Operating two transformers with different tap position will produce circulating current. Does it make unbalanced loaded on transformer? If it is unbalanced, is the current going to flow to the ground via neutral wire? There will be unbalanced load on similar transformers connected to same high and low voltage busbars. Transformer with higher position (lower turn ratio) will have additional inductive reactive current and vice versa. Unbalanced currents caused with different positions (turn ratios) will not go to the ground. It will circulate from one transformer to another through low and high voltage windings connections and busbars. Thanks for the explanation. As we know, power transformers gives their maximum efficiency when they are on the full-load. Using parallel transformers, it is possible to switch on only some of the transformers. We only needed to switch on other transformers when load increasing to fulfill the total demand.